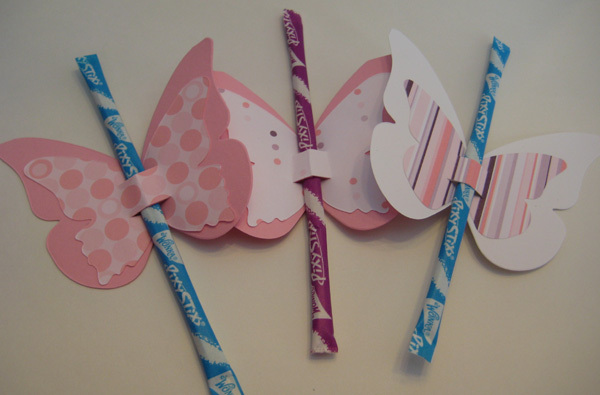 I've been working on these butterflies since October. I know you're thinking - what?!?! I'll explain. I got together with my stamping friends last fall at Deana's house. We all brought our own projects. When I finished what I was working on, I spent my time cranking all of these butterflies out on my Big Shot with a borrowed die. So when we stamped at Rae Anne's house last month, I stamped the back and assembled them so I was ready for Valentine's Day - no stamping February 13th like most years for me! My idea for scrapbook club was inspired by a Creating Keepsakes layout. I liked the simple layout with the few accents and thought it would be nice for most any occasion. 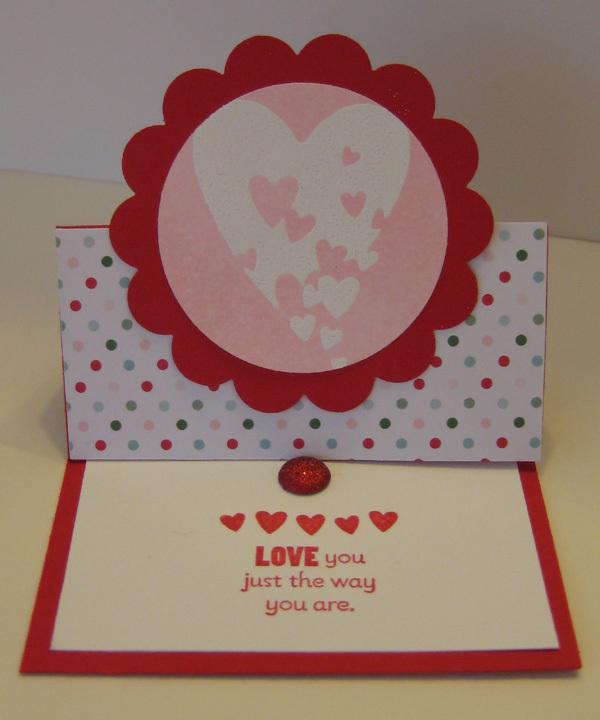 I used the new Designer Rosette XL Die for the bottom strip to add a little dimension. The white scallop is for my journaling - I'm not a good journaler, but I do want to be sure to remember the story behind these brightly colored gingerbread houses in Martha's Vineyard. 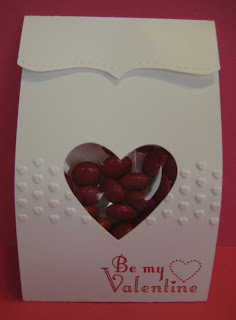 This was a quick little candy pouch for Valentine's Day. 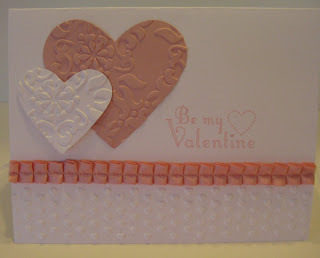 I did use the new heart framelit and textured impression embossing folder, but you could do this for any occasion. I trimmed the cardstock to fit a cellophane bag an filled it with M & Ms. Plain brown wrapper - of course not! With a little help from My Digital Studio, I printed names on cardstock, punched them out with one of our new framelits and added a couple jewels and a ribbon. I was inspired by some bags Stampin' Up! gave us at convention with a cute little label and thought I should try some of my own! 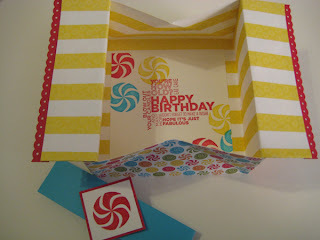 Here's a sneak peek of one of tomorrow night's ﻿stamp club projects and a fun alternative to a birthday card! 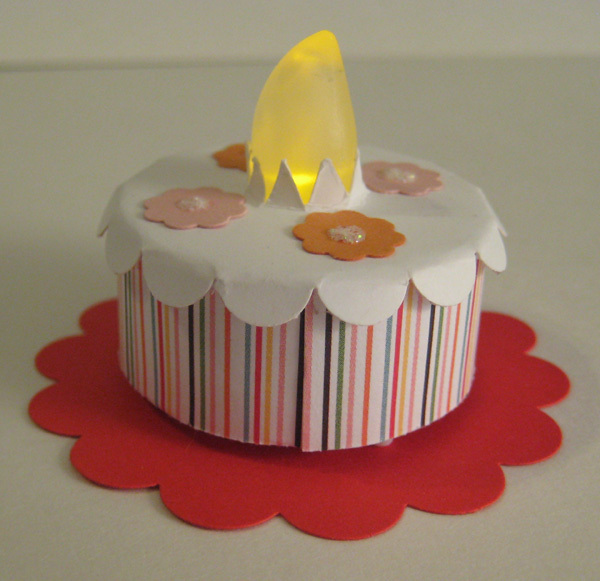 Decorate a battery operated tea light, leaving a hole on the bottom piece for easy on and off. 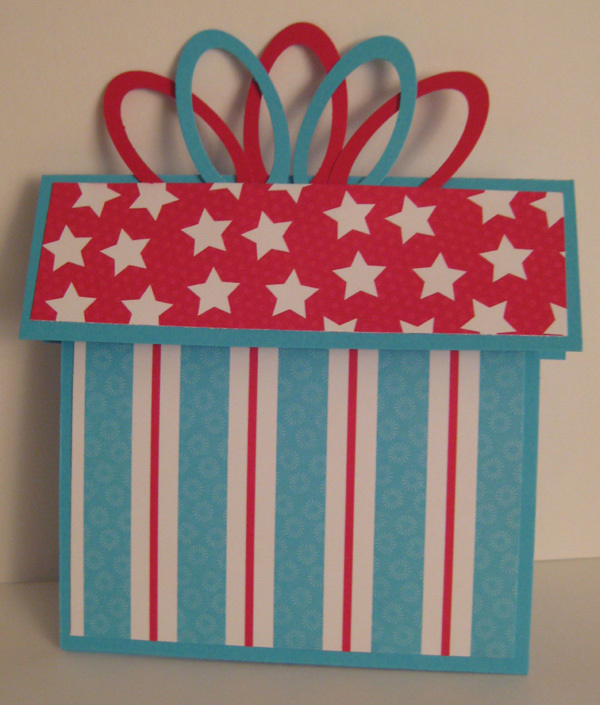 We have so many papers and stamp sets that coordinate that it was quick and easy to whip up a couple more of these box cards. 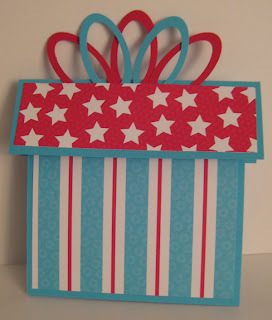 This one uses Big Top Birthday Designer Series Paper and the stamp set Sweets for the Sweet. The greeting comes from Delightful Dozen. Those of you who read my newsletter have already seen this idea. If you don't receive my newsletter and would like to, please sign up in the sidebar. I decided not to decorate the inside of this box card. 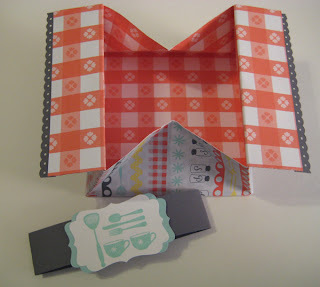 I just loved the picnic tablecloth pattern by itself. I used the Now You're Cookin' stamp and Domestic Goddess DSP. 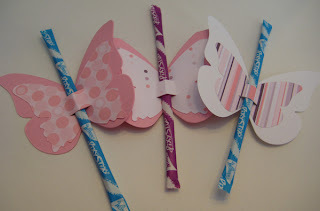 Visit this post for more samples and a link to the directions. 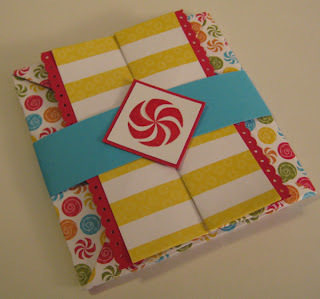 I decided it was time to make a birthday gift card holder similar to the ones we did in club at Christmastime. 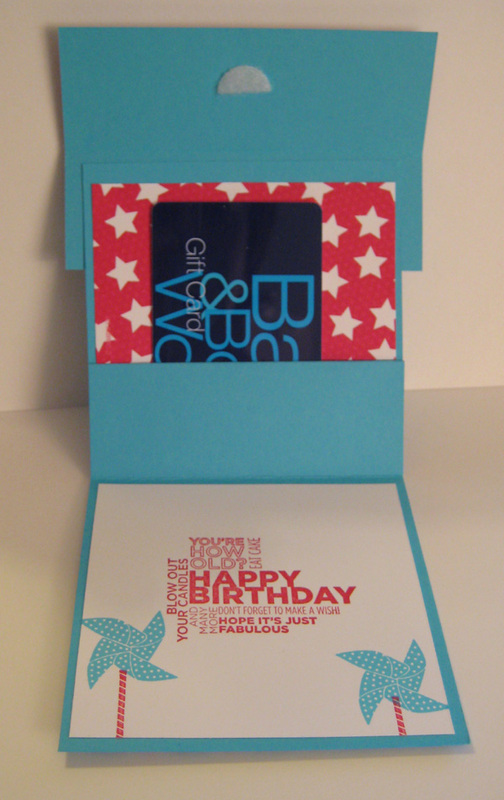 This went to a far away friend so I wanted it to be a little fancier that my normal card, but I made it so that it could be reused for most anyone's birthday. Here are a couple of the awesome scrapbook layouts from club last month. 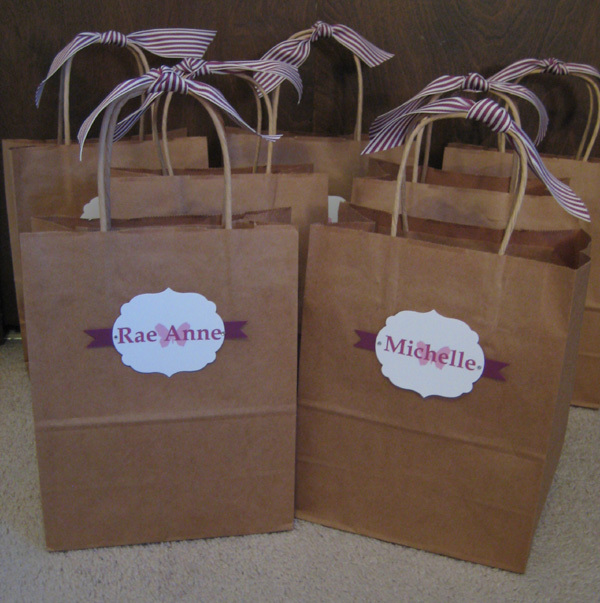 Rae Anne and Becky did a great job, and I loved their color choices. 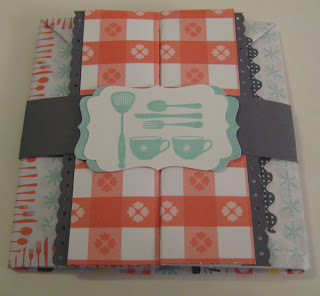 Visit Deana's blog and see her version of the same layout (while you're there, check out some of her other fantastic creations). 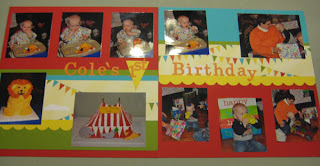 That's one of the things that makes scrapbook club so much fun - same basic layout and so many different pages and ideas! Thanks ladies for letting me share your awesome work. Like many of you, I have become a Pinterest addict. So recently while just poking around on Pinterest, I found a card that I decided to CASE. 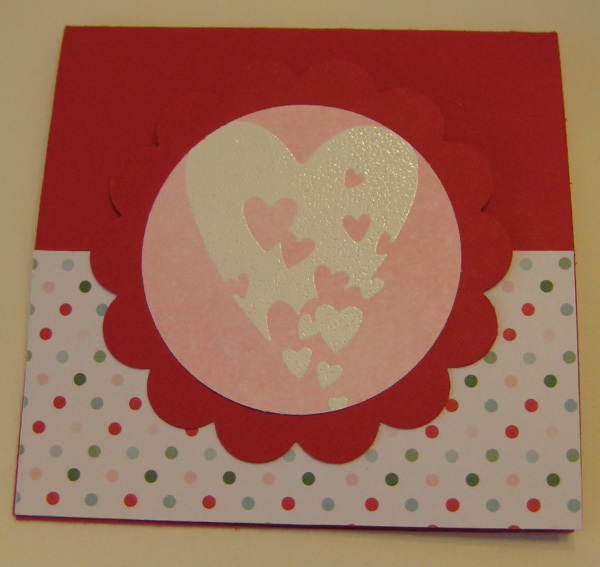 It was just so nice the way it was that I changed the colors a little and the ribbon, but it is pretty much a copy of Melissa Davies card. 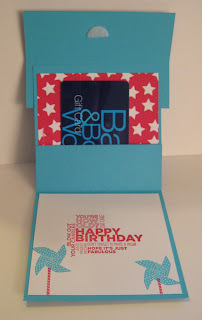 Her card can be found on Stampin' Connection which is a demonstrator website full of fantastic samples like this one. What a cute little set - Sprinkled Expressions is one of the new Sale-a-bration stamp sets and was the perfect stamp to make a "smiley". 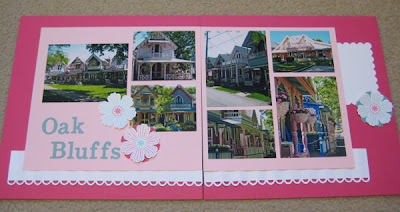 While at a Stampin' Up! regional event a fellow demonstrator demonstrated this cute little easel card and called it a "smiley". Unfortunately my note taking isn't the greatest so I don't remember her name. I am hoping one of my readers can tell me, and then I can add her name to this post. We embossed the heart with white embossing powder and then sponged over the top with Pink Pirouette for an emboss resist before putting the card together.